There's a post over at Dear Author that you should read. Jane Litte used her weekly tech post to put forward the idea that B&N should invest in POD. This idea probably won't work, but it got me thinking about a related hypothetical situation. Barnes & Noble cannot excise the Nook arm completely because its market share in the digital market would be foolish to give up and second a bookstore without a digital component looks backward and incomplete. And the Nook brand is meaningless without Barnes & Noble attached to it. But focusing hundreds of millions of dollars on the development of hardware instead of on selling books is also a non starter at this point. Instead B&N should pour that money into the development of a low cost, high efficiency print on demand machine. 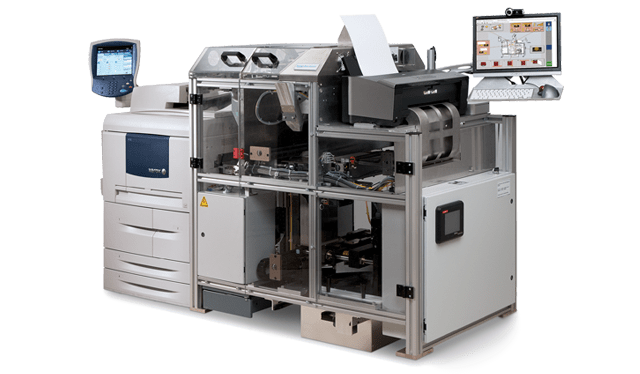 The current print on demand technology requires the installation of a behemoth device that currently costs about $100,000. Have you paid attention to the posts about 3D printing? 3D printers cost about $10,000 and can print out guns, exoskeletons, and even small planes. How is it that it requires ten times the cost to produce something made of glue and paper? It's an interesting idea, but I don't think it would work. For one thing, it's a technological panacea that doesn't address the fundamental issues that led to B&N's current state. But more importantly, a cheap POD solution won't help B&N in the short term because this is a long term project. It's going to take at least 3 years to develop, and could take as long as a decade. Barnes & Noble probably doesn't have that much time, and even if they did I am not sure that they have the gumption to commit to a multi-year capital intensive development program. No, this is the kind of project that someone needed to see coming 4 years ago so development would be about done in 2014 just when B&N needed it the most. Sadly, B&N doesn't have that kind of foresight. It occurred to me today that Amazon is almost certainly working on a print-on-demand machine. I don't have any evidence but if you think about it I'm sure you'll agree that there's a good chance I'm right. Amazon has already invested in POD (CreateSpace). They have demonstrated a deep interest in automated retail (delivery lockers, vending machines). And they are also willing to throw money at a problem invest in a market for years before seeing any return (Kindle). If you line up those 3 points, don't they point in the direction of a print-on-demand machine? Please note that I am not insisting that Amazon has a definite launch day planned, or even that they have a viable model which could be deployed. I am merely arguing that they are working on a print-on-demand machine. This is the kind of project which simply makes too much sense for Amazon to not have jumped in with both feet. Paper books are still the major part of the book market, most of which are sold and distributed in a system that is ripe for disruption. Yes, that's what everyone has been saying about POD for at least the past 5 years, but if Amazon invested in the technology then it could become a practical reality. In fact, let's take this one step further and consider how the scenario might play out. A customer browses on Amazon.com, finds a book they want, and chooses the POD option. The customer is in a hurry, and Amazon can only promise to have this book delivered in a couple days, so rather than wait the customer elects to have the book printed at their nearest FedEx/Kinkos, Staples, UPS Store, or even a local print shop so they can pick it up the same day. What I learned from the (very nice) CreateSpace customer service rep was that my member orders placed directly with CreateSpace get printed in CreateSpace’s own South Carolina facility by CreateSpace’s own team. When I order from Amazon.com, in order to provide that superior shipping turnaround, Amazon sources the print-on-demand printing to other print-on-demand service providers. Don't you think Amazon would be looking for a way to replace that contractor with a POD machine which belongs to Amazon and (ideally) costs less to operate? Rather than partner with a brick-and-mortar operation, Amazon's POD machine might instead be installed in a local mall and left to run on its own (with regular visits from maintenance and supply, of course). In this scenario we would be looking at a machine which would be able to print a book and then insert it into a shipping envelope, attach a sticker, and then dump it in a (locked) bin for the UPS guy to pick up on his next round. Edit: Actually, in this scenario it would make more sense to have the Post Office pick up and distribute the ebooks (or a courier). If Amazon can get that second scenario worked out then they would be able to eliminate most of the personnel, logistics, and time issues involved in printing and selling books. Heck, they might even cut some of their CreateSpace facilities. So, anyway, I get the book from Amazon in an amazingly fast 48-hour turnaround from the time I place the order. I’m very happy with that. What I wasn’t so pleased to discover, though, was a printing defect that had not existed in the proof copy I ordered directly from CreateSpace. The defect is a ridge of excess glue beneath the cover, between the first page and the inside of the cover, within millimeters of the spine. It seems like such a minor issue, but when you set this Amazon.com copy next to the CreateSpace copy, it becomes obvious that the binding on the CreateSpace copy is superior. If you run your fingers along the spine of the Amazon.com-printed copy, you can feel a protrusion of about 1-mm of glue, and looking at the book face-on, there’s sort of a bubbled-out effect of the cover near the spine. It’s not a huge cosmetic defect, but it’s particularly noticeable to the touch, and I imagine that after being pulled in and out of a bookshelf, this could cause the cover ink to wear away around the spine. The CreateSpace copy, by comparison, has a nice, neat, perfectly squared-off spine, with a nice regular ridge pre-folded into the cover to guide the cover crease when the book is opened for the first time. Amazon is dedicated to offering the best service, and that means they would want to sell the best POD books possible. I think they are deeply interested in replacing the less-than-reliable printing partners. A POD machine in your local mall or FedEx Kinko's would fit the bill, don't you think? The real question here is why publishers don’t support these POD machines. Presumably these would cost the same amount as regular paper books, so they don’t fear price erosion. I do believe Barnes and Noble has POD machines at their warehouses. I ordered a book in store that was a POD from Barnes and Noble and got the book in 4 days. The bookseller showed me the status and I saw POD myself. Not necessarily. They might have a contract with a POD service like the one mentioned in the post. I don’t know that they still do any on-premises printing, but B&N had some POD machines in their warehouses at the turn of the century. Other references can be found, but none I saw had any real detail. Some articles from the time referred to it as “experimenting”. With little said since, I’d presume they found it less trouble to have POD clients go through Lightning Source et al even though it sacrifices some fulfillment speed. I don’t know what happened to that effort specifically, but I do know that B&N got out of ebooks in 2003. I would not be surprised if B&N also gave up on POD about the same time. And thanks for the details; that is new to me. Interesting notion. They wouldn’t even need a machine, really. There’s nothing the Espresso does that a FedEx Office couldn’t do almost as well. Copy/print shops have black and white and color printers, trimmers, and binders. They could make the book themselves on demand. It’s just that the Espresso does it without all the extra people. That’s what Amazon already has, in a way. For all we know that poor-quality POD book mentioned in the post was made in a print shop. Part of the reason why I argue for a machine is that it might be more efficient and reliable (see the poo quality book). Also, I’m not sure that the average Kinko’s or Staples is really set up to process as many POD book orders as Amazon could send. A POD machine can be designed and built by KIVA + Lab123. I still think they can use the automat/laundromat model with kiosks, lockers, vending machines, and POD in a Gamestop model to fill out their market reach. So yes, POD makes sense. I think POD-in-a-mall makes sense, considering they are already trying out Kindle kiosks in airports. This is not new speculation. But I am surprised by some of the in-the-box thinking. Why, exactly, does a printer capable of printing a book have to do so on paper and with glue and a paper cover? Maybe there’s a material, plastic or polymer of some sort, that will do just as well or better. Everyone assumes that a desktop device to print a physical book must construct that book from the same materials as current physical books. Why? Why not imagine a printed book that you can recycle after reading to print yet another book? I could have a 3-d printer on my desk and I can use a book I have read as the raw materials to “print” another book. 3-D printers are already well below $10K — a quick Google shows there’s one for $1300. In order to be commercially successful the POD machines have to print what customers expect. That means paper pages and paper covers. Sure, better options could be developed, but it would cost a lot more both to refine the material tech and develop a machine to produce the better book.